Mornings on Lake Atitlan, Solola, Guatemala are pretty incredible. There is a misty-fog over the water and the air is surprisingly cool. I've spotted this same fisherman every morning on this particular walk I take along the lake. He always waves back at me ... and sometimes I wonder what he is thinkng. Why anyone would possibly want to take a shot of him doing what he does to eat everyday. Sometimes I feel like a peeping-tommette person spying on someones life like this. Not sure if I have come to terms with doing "people-pictures" yet. I know we all like to see how other people in the world live. But think about it. Would we be very happy if some camera toting tourist wandered along the street where we live and started snapping pictures of us having a drink on the balcony or a BBQ in the back yard? Nice of this man to put up with me in the mornings -- maybe we share a bond of the beauty of this place and the peaceful mornings where the birds and and water are the only sounds that lull us into a sense of "all is well with the world". This world, this morning, anyway. Hi, I always feel a bit awkward doing people shots, i suppose you just never know what they might do and quite rightly so it can be seen as an invasion of their privicy as we are watched so much as it is, that one of the reasons i will stick with nature ans all its glories. Excellent photo. 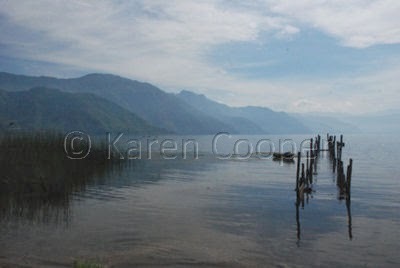 Lake Atitlan certainly is beautiful. When I take pictures of the Mayans, I offer them a copy of the photo. It works wonderfully! As a member of the TCPC, I was told of this wonderfully written blog with superb photos. I have been back frequently to see your site and really appreciate the spirit and passion you bring to your blog. As a trainer, I have come to realize the value of powerful visual images in teaching concepts and your photos continue to provide inspiration in that regard. Great pics (as usual)! I don't know that much about Guatemala. Did you get some pictures of the flowing lava? Hey, concerning taking picture of people... well it really depend on yourself, if you have enough courage to ASK if you can take picture - this is how professional photographers do, they ask before taking pics. Some people around the world are very proud of their culture and tradition and love to share that with foreigners... but there are some that treat their privacy very seriously... so it's really risky sphere of art... but well - all depends of people. I think your approach is the right one. You seem to have struck a sort of friendship and even though you may not speak the language a shake of the a camera from you and a nod from him may be all you need. Just wanted to take a minute to thank everyone who has left me such wonderful and inspiring comments. Can't tell you how much they mean to me. And here I thought no one read this! Since internet access is a bit iffy where I am at the moment, the posts won't be as frequent. Life, what can I say? I am having a hoot, though. That is important. Thanks for letting me share my wee bit of the world with you all! in english i visited the solola area and lake aititlan many years ago. thanks for the memories.